Perfect hostel very close to the square. Clean an beautiful room, bathroom and patio. Welcoming staff. Nice breakfast. We loved it and we would recommend it. Regards from Spain. Es pintoresco, con sólo 4 habitaciones, un patio tranquilo y muy fresco, donde sirven el desayuno, y con una linda terraza donde tomar un te o descansar en los sillones. Pros Lovely traditional feel and decor, and in a great location. The staff were accommodating and friendly. I would definitely stay again. Cons There was no variety with breakfast. No safe provided. Language barrier was difficult. Located very centrally, this was a great place to stay! The pastries as breakfast were good. I'd suggest going to Roti D'or for food - it's just a few minutes away. They took euros or dirhams as payment. Good wifi and good air con! Very welcoming staff. Very reasonably priced with a nice breakfast. A lovely balcony upstairs to enjoy a calm moment away from the madness but still only a 5 minute walk from the Djemaa el Fna square. The host was extremely friendly, the location is ideal (just a 3min walk from the main square) and the room and atrium seemed authentically Moroccan. I would recommend this riad 100%. 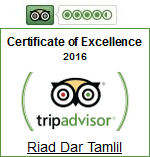 We had a wonderful stay at Riad Dar Tamlil - such a peaceful, quiet, sunny, beautiful place! Staff were always friendly, our room on the first floor was great and the roof terrace as well! We had a very stay, staff were friendly and very helpful. When we first got to the area, this local showed us the way for money and took us to the wrong place and left us. We were able to call Riad Dar Tamlil and they sent somebody to walk us to the hotel. Then, we were warmly greeted with amazing mint tea and cookies. The next day they arranged a tour for us in the mountains-river and camel rides for a very good price. The hotel was clean and authentic. The bed was comfortable and the staff even shared their personal food with us. We came during Ramadan time...the time where everybody was fasting all day. We felt bad that they were not eating and we were, but they are such good people that they told us it is their practice and that we should not feel bad. It was just perfect and very close to the center or market. I cant say enough good things about this place. Definitely recommend this place if you are staying in Marrakech. The only thing is that all the Riads and hotels in this area are in scary looking allies but its a very old town that was made before cars existed. It is very safe, even though there is a lot of pushy vendors and people that ask for money but that is all of Marrakech except for the Dar Tamlil staff. They are very good people. Absolutely Perfect! I traveled to Marrakech with my best friend and we found this riad on hostelworld. It was absolutely perfect. Everyone was so hospitable and kind. We arrived rather late (around midnight) because our flight was delayed and we were still greeted with a smile and freshly brewed tea and sweets. The room was perfect and stayed nice and cool at night leaving the window open. The bathroom was nice and the showers were hot! The breakfasts were perfect and really yummy. They also have dinners available at incredibly reasonable prices. The food was so good! Everyone we talked to was so kind and friendly, always smiling and willing to help us out. We left early to catch our flight to Amsterdam, and to our surprise there was a knock on our door with breakfast even though it was before the scheduled breakfast hours. This riad is a really special and beautiful place, I highly recommend to anyone staying in Marrakech. Great location right outside the medina! I give it a 10. Thank you so much! The hostel is in a location 3 minutes from the square but on a street that wasn't my favorite. The hostel is like a little oasis inside and I had the best Chicken Tajine here out of every restaurant I ate at in Morocco. Magical Marrakech My friend and I are just back from 4 nights in Riad Dar Tamlil and I can say that it was one of the best Hostelworld finds yet. Abdul is a fantastic host who went above and beyond to make sure we were comfortable and happy in Marrakech (even getting out of his bed extra early one day to go and buy us breakfast and exchange money for us so we didn't have to ourselves.) The room was a perfect size and the Riad has a beautiful terrace which looks on to Moroccan rooftops and sunsets. Thanks Abdul!! Eine perfekte Woche in Marrakesch Unser 1-wöchiger Aufenthalt im Riad Dar Tamlil im September 2014 war hervorragend. Ein kostenloses Shuttle brachte uns in die Innenstadt. Das Riad liegt im Herzen Marrakeschs, bietet durch seinen ruhigen, schattigen Innenhof und der sonnigen Dachterrasse aber auch eine kleine Ruheoase für Stunden der Entspannung und Erholung vom hektischen Treiben der Stadt! Da das Riad nur 4 Zimmer hat, ist die Atmosphäre sehr ruhig und familiär. Das Personal ist sehr höflich, sehr hilfsbereit und hat unseren Aufenthalt perfekt gemacht! So wurden uns Wasserflaschen auf das Zimmer getragen und angeboten, die Flaschen im Riad-eigenen Kühlschrank zu kühlen. Bei Fragen konnten wir uns immer an sie wenden und haben somit den ein oder anderen Geheimtipp erfahren. Die Zimmer sind genau so, wie man sie sich in einem traditionellen Riad vorstellt, sauber und sehr schön sowie traditionell eingerichtet. Wer einen Aufenthalt in einem traditionellen, marokkanischen und sehr persönlichem Riad einem touristenüberlaufenen Hotel vorzieht, wird im Riad Dar Tamlil voll auf seine Kosten kommen! My friend and I are just back from 4 nights in Riad Dar Tamlil and I can say that it was one of the best Hostelworld finds yet. Abdul is a fantastic host who went above and beyond to make sure we were comfortable and happy in Marrakech (even getting out of his bed extra early one day to go and buy us breakfast and exchange money for us so we didn't have to ourselves.) The room was a perfect size and the Riad has a beautiful terrace which looks on to Moroccan rooftops and sunsets. Thanks Abdul!! Sehr schöner Aufenthalt Bei der Ankunft am Abend wurden wir sehr nett empfangen (mit Minztee und Gebäck). Das Zimmer war gemütlich, etwas sauberer hätte es sein können (Wölkchen unterm Bett). Alle waren sehr nett und hilfsbereit, auch beim Buchen von Ausflügen. Dieses Riad bietet eine gemütliche und familiäre Atmosphäre und hat eine ausgezeichnete Lage. Zum Djemma el fna ist es nur ein Katzensprung und zur anderen Seite Richtung Bahiapalast ist es auch nicht weit. Frühstück war inklusive, lecker und von der Menge absolut ausreichend. Es gab jeden Tag ein Blätterteigteil und Brot (hell und dunkel), dazu Marmelade, Käse und Oliven, Kaffee und Milch. Für diesen Preis ist das eine super Unterkunft.